Nanoengineers at the University of California, San Diego are asking what might be possible if semiconductor materials were flexible and stretchable without sacrificing electronic function? Today’s flexible electronics are already enabling a new generation of wearable sensors and other mobile electronic devices. But these flexible electronics, in which very thin semiconductor materials are applied to a thin, flexible substrate in wavy patterns and then applied to a deformable surface such as skin or fabric, are still built around hard composite materials that limit their elasticity. Lipomi compared the difference between flexible and stretchable electronics to what would happen if you tried to wrap a basketball with either a sheet of paper or a thin sheet of rubber. The paper would wrinkle, while the rubber would conform to the surface of the ball. 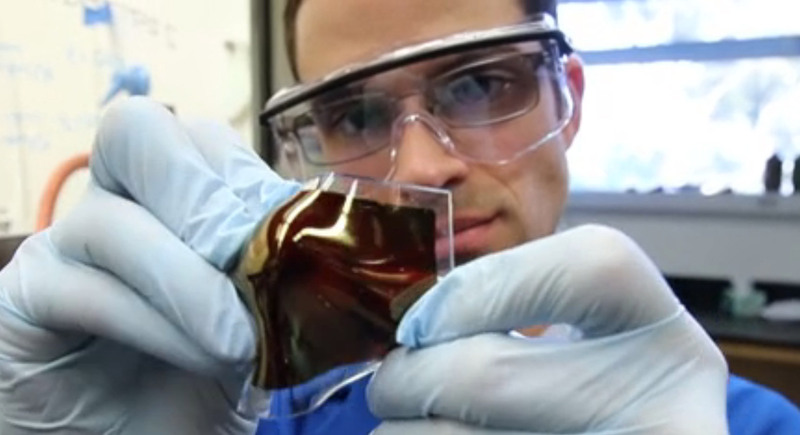 While flexible electronics based on thin-film semiconductors are nearing commercialization, stretchable electronic materials and devices are in their infancy. Stretchable electronic materials would be conformable to non-planar surfaces without wrinkling and could be integrated with the moving parts of machines and the body in a way that materials exhibiting only flexibility could not be. For example, one of the chief applications envisioned by Lipomi is a low cost “solar tarp” that can be folded up for packaging and stretched back out to supply low cost energy to rural villages, disaster relief operations and the military operating in remote locations. Another long-term goal of the Lipomi lab is to produce electronic polymers whose properties—extreme elasticity, biodegradability, and self-repair—are inspired by biological tissue for applications in implantable biomedical devices and prosthetics. Lipomi’s team has also created a high-performance, “low-bandgap” elastic semiconducting polymer using a new synthetic strategy the team invented. Solid polymers are partially crystalline, which gives them good electrical properties, but also makes the polymer material stiff and brittle. By introducing randomness in the molecular structure of the polymer, Lipomi’s lab increased its elasticity by a factor of two without decreasing the electronic performance of the material. Their discovery, published in RSC Advances, is also useful for applications in stretchable and ultra-flexible devices.